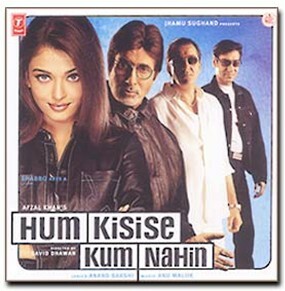 I wonder what prompted Dhawan to attempt a Hindi remake of the dry-humour based "Analyse This"? Truth be told, the original flick put me to sleep, but I had high hopes for the Indian version. After all, we do know that Dhawan is a master with entertaining, albeit leave-your-brains at the door, remakes. Dr. Rastogi (Amitabh Bachchan) is an all-in-one physician, surgeon, psychiatrist in one. And his gorgeous little sister, Komal (Aishwarya Rai), teaches aerobi-dance to troupes of adults. The tale unfolds when Mumbai´s crime Baadshah, Munna Bhai (Sanjay Dutt), crosses both their paths. The Kingpin falls head over heels in love with Komal, after she scolds him for bashing up another hoodlum in her dance school. Thereafter, the poor sap endures countless sleepless nights and has illusions of her presence twenty-four, seven. Being unable to rob, kill and maim is no way for a don to behave, so Munna´s sidekicks take him to seek Dr. Rastogi´s advice. Neither party knows they each share a bond with Komal, and Rastogi, fearing for his life, begins helping Munna deal with the problem. At the same time though, Doctor Saab doesn´t know that his sibling is smitten with Raja (Ajay Devgan), an orphan that his family has spent a lot of time with over the years. Ensues an unending sequence of events with Raja and Munna each vying for Komal´s hand, and the sad Doctor trying to protect his sis from the big, bad world. The film´s tickle-your-funny-bone potential was limitless. But in the most critical places, it goes so woefully wrong. Dhawan and the screenplay writers forgot to invest time in giving the lead characters any quirks or depth. So we don´t care if any of them succeed in their efforts. Not even poor, old Dr. Rastogi. What can the stars do if the roles they are given are mundane? Nothing, right? So don´t expect anything exciting in the performances. The editing, oh, the editing! The editing is hands-down some of the worst you will ever see in a big-budget movie. We jump from one set of boring events to the next, with no logical connections. There is no fluidity or pacing. Some will argue that Dhawan films are rarely logical, which is true. But his best films have always been smooth rides in terms of story exposition. This time, darn it, we´re on long and rocky roads. And you should not have to tolerate such carelessness from a director who was once an editor himself. But let us get back to the key success indicator for a comedic flick; the laughs. Where are they in Hum Kisise Kum Nahin. Rumi Jaffry used to be able to write "a-laugh-a-minute" dialogues, but that is not the case here. The jokes are tired, few and far-between. Most often, we´re just in agony watching the proceedings. There´s no novelty or excitement watching Dr. Rastogi immitate a gangster, or Raja play telephone goonda-giri with the Doctor. It´s all stuff we´ve seen a million times before. For a nearly three hour movie, the experience is torture. The idiotic action and melodrama in the last half-hour, particularly, insists upon dragging itself out to no end. Manmohan Singh´s framing of virgin Malaysian locales, the tacky Rastogi house sets, Anu Malik´s peppy tunes, boring dance sequences or Aishwarya´s beauty, nothing can relieve the tedium. 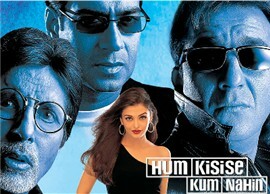 We are forced to reach one of two conclusions having watched David Dhawan´s Hum Kisise Kum Nahin. Either the man needs a one-year break to regain his creative faculties or his talent has disappeared. For his sake and ours, I hope the former is true.